being committed to working at making relationships grow. But when they say this to me, I don’t go into all of that. I simply tell them that while it may be theoretically possible to be a Christian without Christ’s Church, the Bible knows of no such possibility. When Jesus and the New Testament writers speak of discipleship, the life of faith, it’s never as a solo proposition. Even if, as Jesus says, we may have to choose Him over family members and friends, He does not call us to a “Jesus and me” relationship. Jesus calls us to a "Jesus and us" relationship. Jesus always calls us to be part of His body, the Church. He calls His disciples to be the Church. Being the Church doesn’t mean that we’re part of a pack of automatons who think alike and never disagree. The New Testament has many examples of how the early Christians argued and disagreed with each other, even while Jesus lived and walked among them. Or how James and John ticked off the other apostles by asking for special places in Jesus’ kingdom? And how, after Jesus had dies, risen, and ascended into heaven, the Greek-speaking Christians and the Jewish Christians got into a dispute over whether one set of widows was being better treated than another? Or how Paul and Barnabas split up their ministry team when Paul wouldn’t agree to take along a young pastor Barnabas wanted to take who Paul thought was unreliable? And who can forget Paul reminiscing about a long-previously-resolved argument that he’d had with Peter? “When Cephas [Peter] came to Antioch,” Paul remembered, “I opposed him to his face, because he stood condemned.” (Galatians 2:11) (Way to let go of things, Paul!) While the two did resolve their dispute, there’s no record of Paul saying that later, he and Peter sang Kumbaya together. When Jesus established His eternal salvation community, the Church, He fully anticipated that His people would sometimes disagree or even disappoint each other. If the Church is Christ’s designated means for turning imperfect sinners into sanctified saints, you can bet that those people who, while on this earth, are simultaneously saints and sinners, will sometimes rub each other the wrong way. Do you know what you call a couple or a family in which there is never disagreement? Dysfunctional. The absence of disagreement in a church or the absence of a capacity to deal with disagreement in a healthy way indicates not that the people of a church love each other, but that they don’t care about the common life to which they have been called by the Holy Spirit. Who do you get angriest with: people you don't know or people you love? A couple that refuses to deal healthfully with disagreements in their marriage demonstrates that they really don’t care about their marriage or each other. The life of a disciple is other-minded. Within the fellowship of the Church, Christ seeks to set us free from all obsessions with ourselves--our desires, our will, our fears, our pride--to focus entirely on the God we know in Christ and His will for our lives and on others. The bottom line is this: The Church, with its imperfect members and its imperfect pastors, is the indispensable means by which Christ brings His perfect, eternal kingdom to the world. for the spiritually disconnected of the world. 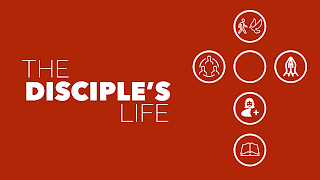 The only way to be disciples is to be the Church. This is why the words of Jesus that we read a few moments ago are so important. They give us our marching orders as disciples and as the Church. In John 13:34-35, Jesus gives a new commandment, new because in it, He doesn’t just command Christians to love others as we love ourselves. He says that our love for the sisters and brothers who make up the Church should go way beyond that low standard. Look at what Jesus says: “A new commandment I give to you, that you love one another: just as I have loved you, you also are to love one another. By this all people will know that you are my disciples, if you have love for one another.” We are to love our fellow Christians the way Christ loved us: with suffering, self-sacrifice, and commitment. But Jesus is clear that our fellowship as Christian disciples is not to be a closed circle. Our love shouldn’t be confined to those who like us or we find companionable. (As Jesus says, “If you love those who love you, what reward will you get? [Matthew 5:46]) And by the way, how companionable do you think the apostle Paul was sometimes? Or Martin Luther? Disciples, members of Christ’s body, the Church, refuse to withhold the gospel of new life for all who repent and believe in Jesus Christ from the world. Pastor Rick Warren memorably says that the church that cares nothing about making disciples is really telling the world to go to hell. May we never be that church! If being the Church sounds daunting, good. It is. One day, by the grace of God, I hope to learn this truth. Being part of Christ’s Church isn’t like being a member of the local wholesale club in which you pay your dues to derive benefits. It’s not like joining the National Geographic Society where all you do is send them some money and get twelve months of glossy pictures from around the world. To be the Church is to be a community of disciples called to a way of life that is impossible apart from the God we know in Jesus Christ: a life of love for God, fellow disciples, and the world, come what may. Just as it’s impossible for a couple to fulfill their marriage vows apart from the help of the God we know in Jesus, it is equally impossible for us to be Christians without the grace of God we receive in Jesus. To live this impossible life together, Christ has given us means of grace: repentance, the Word of God read, pondered, shared, savored with others, and proclaimed, and the Sacraments. And He's given us something else. Do you know what it is? He's given us one another. He's given us each other. 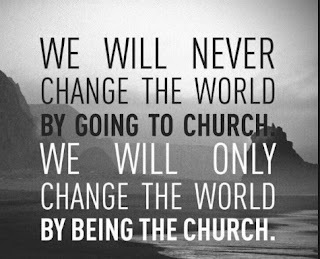 Christ has given us His Church. 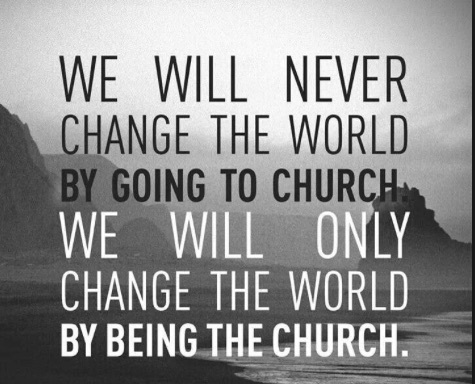 To be disciples, we must be the Church. More next week.